Late Classic, ca. A.D. 550-950. This vessel painted with two fish with barbels beneath the mouths swimming in the primordial sea, decorated with black spots. There are two sea shells, each one between each fish. The rim is encircled by a chevron band with finely detailed motifs. The vessel is painted overall in bright shades of red-orange, pink, gray, white, and black. The Hero Twins were transformed into fish in one of their epic sacrificial adventures in the Underworld. Dimensions: Height: 6.5 in. (16.5 cm.). Provenance: Sotheby's, New York, November 22, 1993, Lot 130. Cf. 1) Justin Kerr, The Maya Vase Book, Vol.3, p. 401, no. 3266, New York, 1992. 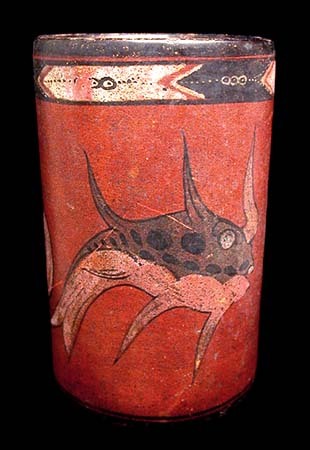 2) Hasso von Winning, The John-Platt Collection of Pre-Columbian Art, Fig. 137, The University of Virginia, Charlottesville, 1986. 3) Dorie Reents-Budet, Painting the Maya Universe: Royal Ceramics of the Classic Period, fig. 6.8, Duke University Museum of Art, 1994. 4) Dallas, Chocolate Pots and Tomb Guardians from Ancient Mexico, Dallas Museum of Art, June 1990-September 1993, from the Peter G. Wray Collection. Footnote: A nearly identical vase was sold at Sotheby's, New York on May 28, 1997 for $17,250.